Bernie is a horse-drawn coachbuilder, blacksmith and wheelwright by trade and is the curator of the museum. After his improvemanship, Bernie started his trade in December 1970. Bernie has restored each of the museum's vehicles and each of the vehicles are used in displays and functions throughout the year. Frances is an Arabian Horse Breeder of Stoneycroft Arabians specialising in the Nantouka bloodline of Crabbet Arabians. Larry has given over 15 years of support and technical assistance not only at the museum but at also at events. Larry plays a vital role in logistical and manpower support and also as lead brakeman of the horsedrawn vehicles. Larry continues to volunteer his time and expertise to the Dingle family and the museum and is conscidered as a very dear friend and one of the family. Edward is an Electronics Technician who served in the Signals Corps of the Royal Australian Army. Edward now works as a security technician. Tamara is now retired and is also involved with natural horsemanship and communication concepts. Colin volunteers an enormous amount of time to the general care and maintenance of the museum. Colin has also played a vital role in a number of major projects including the museum mural, library, kitchen and toilet facility upgrades. Gordon not only volunteered much assistance with the horses but through his training, tuition, and guidance, Gordon allowed us to assemble our six-horse gun team. 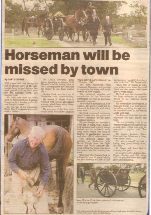 Gordon was a true horseman and his quit wit and sence of humour will remain in our hearts forever more. He is dearly missed. Hugh volunteered many hours of time to the audio upgrades in the museum. Hugh also provided accomodation for our personnel during the week around ANZAC day for many years. Until his recent passing, Hugh was the director of McLean Sound in Caulfield, Victoria, a company started by his father in the 1920's. Hugh was known by many as "the gentleman of audio".